How do children cope when their world is transformed by war? This book draws on memory narratives to construct an historical anthropology of childhood in Second World Britain, focusing on objects and spaces such as gas masks, air raid shelters and bombed-out buildings. In their struggles to cope with the fears and upheavals of wartime, with families divided and familiar landscapes lost or transformed, children reimagined and reshaped these material traces of conflict into toys, treasures and playgrounds. This study of the material worlds of wartime childhood offers a unique viewpoint into an extraordinary period in history with powerful resonances across global conflicts into the present day. Gabriel Moshenska is Associate Professor in Public Archaeology at University College London, UK. The Material Culture and Modern Conflict series adopts a genuinely interdisciplinary approach to re-appraise the material legacy of twentieth and twenty-first century conflict around the world. It offers a radical departure in the study of modern conflict, proving a truly interdisciplinary forum that draws upon archaeology, anthropology, military and cultural history, art history, cultural geography, and museum and heritage studies. 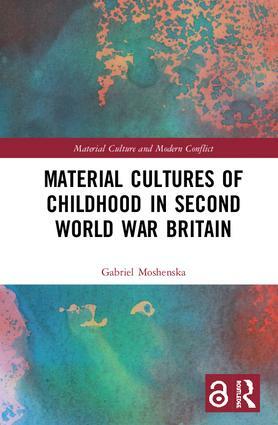 Read Material Cultures of Childhood in Second World War Britain Open Access. Open Access content has been made available under a Creative Commons Attribution (CC BY) license.